Buy 1 for $8.39Buy 2 / Save $0.45!Buy 3 / Save $1.68! 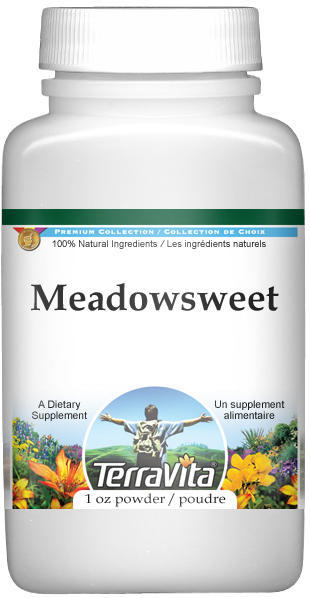 Meadowsweet is one of the best digestive supportives available and as such will be indicated in many complaints, if they are approached holistically. It acts to protect and soothe the mucous membranes of the digestive tract, reducing excess acidity and easing nausea. It is used in supporting heartburn, hyperacidity, gastritis and peptic ulceration. Its gently astringency can be useful in supporting diarrhoea in children. The presence of aspirin-like chemicals explains Meadowsweet's action in reducing fever and supporting the pain of joint pain in muscles and joints. Meadowsweet is a common wild plant in Britain, throughout Europe, parts of Asia and an escape in North America. It's primary health actions are anti-rheumatic, anti-inflammatory, carminative, antacid, anti-emetic, astringent, diuretic, and sub-tonic. It is a valuable medicine in diarrhea, imparting to the bowels some degree of nourishment, and of astringency. It is also considered of some service as a corrector of the stomach, and not without some power as an alterative, and is frequently used in affections of the blood. Meadowsweet is a very interesting herb because its flower buds were the first discovered source of salicylic acid in 1835. This is an important piece of information because aspirin was later synthesized from salicylic acid. The flower can also be used as a mild sedative and painkiller, thus the link to aspirin. Once in the stomach, the salicin in Meadowsweet breaks down to create salicylic acid, which is the same action taken by aspirin.